After a stellar 2012, in which U.S. banks produced income levels to rival pre-crisis highs and some pretty decent first-quarter reports from the likes of Wells Fargo & Co (NYSE:WFC) and JPMorgan Chase & Co. (NYSE:JPM), big banking seems poised for a slowdown. The primary culprit will be the mortgage industry, which the Mortgage Bankers Association notes will decrease home lending over the rest of this year, compared to last, by 16%. While some banks, notably Wells Fargo & Co (NYSE:WFC) and Bank of America Corp (NYSE:BAC), are fighting back against this trend, JPMorgan Chase & Co. (NYSE:JPM) appears to have made peace with the idea of lower profits for the remainder of 2013. The big bank seems to be exhibiting some malaise in areas other than mortgage banking as well. Here are three reasons I think JPMorgan is in a funk. Although many megabanks are promising to slash employee numbers this year, JPMorgan has the largest number of pink slips at the ready — 17,000, to be exact, constituting nearly 81% of the combined 21,000 that the six biggest banks plan to trim before the end of next year. Layoffs are to be expected as troubled loan portfolios become more manageable, but these cuts are huge and approximately 14,000 of those layoffs are said to come out of the bank’s mortgage unit. At the same time, Wells and Bank of America Corp (NYSE:BAC) are both adding to their mortgage departments. 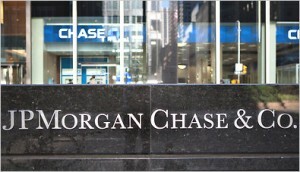 Perhaps JPMorgan Chase & Co. (NYSE:JPM) is responding to first-quarter numbers that showed an increase in year-over-year mortgage originations of 37%, while delivering a 31% dip in net income due to narrower margins. After falling a few notches in the Euromoney foreign exchange listing last year, JPMorgan has decided to no longer participate in the survey, in which investment banks ask for customers’ support in an effort to climb higher in the rankings. Does this matter? It might, as this yearly ritual apparently has some effect on rankings. Though observers note that Goldman Sachs Group, Inc. (NYSE:GS) also stopped canvassing for votes several years ago, it was also noted that JPMorgan Chase & Co. (NYSE:JPM) could drop another tier in the rankings because of this decision.